We need your help! 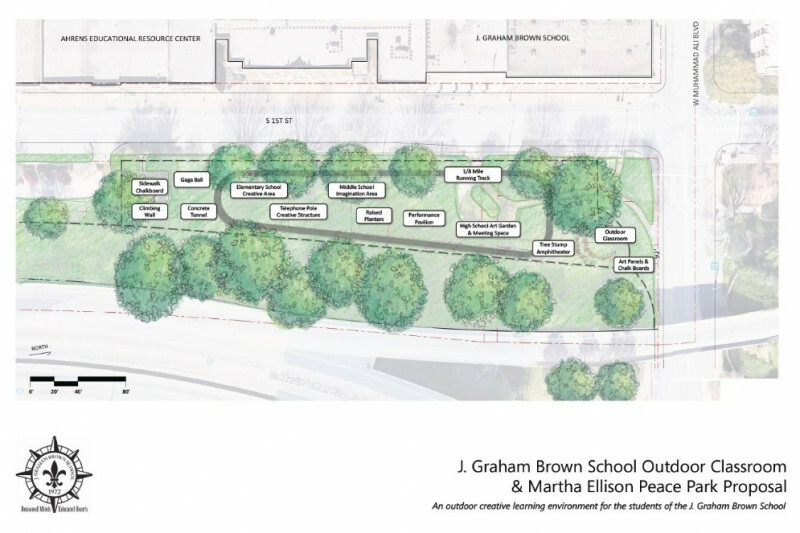 Please donate to the J. Graham Brown School PTSA Fund for the Martha Ellison Peace Park Renovation. Through this exciting new spring fundraiser, 100% of the funds raised will directly benefit the long awaited renovation of the Brown School Peace Park. Every bit helps Brown School students realize an outdoor space for recreation, learning and fun. A project of this kind will exceed $150,000. We ask that you share this Go Fund Me donation page with your friends, families and supporters of your student or the J. Graham Brown School. Your donation will be applied toward creative playground equipment and furnishings, an outdoor track, drinking fountain, outdoor seating, planter beds and other enjoyable, outdoor, educational, opportunities for elementary, middle and high school students. We have been advised that restrictions prevent JCPS from funding this project and therefore all of the funds for the furnishings must be raised through the PTSA, which is a 501c3 organization. Donations are fully tax deductible. Please add your name to this project. All donors to this spring campaign will be recorded and recognized. Since last year, we have raised nearly $24,000 in donations from families, students, faculty, alumni and retired faculty and through the combined efforts of Go Fund Me, the Fall Festival, Kroger Rewards Program, Box Tops for Education, Amazon Smile, PTSA Merchandise and more. Together we can do this! Help build this space for the students and leave a lasting legacy in their honor. Thank you for your generosity and support of Brown School Students. We would like to thank everyone who has supported the park so far. Thank you also to Ashley Chesman for your work to get this project started so long ago. Please read Ashley’s story below, as posted when we began the Go Fund Me account in the spring of 2017, as she shares with us how our park has gone from a dream to a reality. My name is Ashley and I have a second grader and fourth grader who attend J. Graham Brown School in Louisville, Kentucky. When we started looking at Kindergarten for my daughter (5 years ago), we explored several options, but absolutely fell in love with Brown. The ONLY drawback was that the school, being smack-dab in the middle of urban Louisville, offered no playground. Yes, you read that right. No playground. I'm not sure about you, but some of my best elementary memories come from recess! The school does an amazing job of getting physical activity for the kids, including classroom movement, gym time, and walking field trips, but that doesn't provide the same benefits as every day outdoor play, especially in our youngest students. When my daughter was in first grade, I started asking questions about Martha Ellison (Brown's founder) Peace Park, which is right across the street from the school. I learned that the property was owned by the city. I also heard a rumor that the city would lease it to the school for a nominal fee. After months of research, e-mails, and phone calls, I found out the rumor was TRUE. Metro Louisville Government WAS willing to lease the park to JCPS. But, now, how does something like that happen? I'll tell you, from first-hand experience: It takes a lot of e-mails, a lot of phone calls, a lot of follow-up e-mails, and a lot of follow-up phone calls. It also takes a tenacious spirit. Finally, four years after I started my research into how to obtain the park for the school, we have a lease, signed by Louisville Metro Government and JCPS. This lease goes to the School Board for approval on May 23rd. We have asked JCPS to provide an 8 ft vertical fence (so that it cannot be climbed), with 3 entry/exit points, locked with either a combination lock or scanned entry card. We also asked them to lay a walking track inside the fence. Now, here's where we need YOU. We need to fund this playground!!!!! The lease states we can install semi-permanent playground equipment, and after doing some research, I've learned that it's VERY expensive. We're asking for any donation--big or small--to help fund this. I can promise you we'll use every single penny. If we fund the playground, we'll use any remaining funds to create an "outdoor classroom" in the park where teachers could take students on pretty days. Please share this campaign. We need all the help we can get. And, your donation is 100% tax deductible!!! If you would prefer to donate directly to the school, you may do so! Please make check payable to "Brown School PTSA," with "Playground" in the memo line. There is a locked box in the office where you can drop a check (or cash) anytime. Class of 99 graduate Mike Hampshire and his wife Shannon have set up a fundraiser on their Norwex page! !